New morphological, molecular and ecological data for Ditrachybothridium macrocephalum Rees, 1959 (Cestoda: Diphyllidea) are presented and discussed based on specimens recovered from the blackmouth catshark Galeus melastomus Rafinesque (Scyliorhinidae) in the Western Mediterranean. A redescription of the plerocercus of this parasite is provided and new data on immature and mature worms including the first description of the eggs are reported, based on light and scanning electron microscopy observations. Analysis of 28S rDNA (domains D1–D3) sequences from plerocerci, immature and adult specimens revealed that they are conspecific with specimens from the North East Atlantic. Although previous authors considered that museum specimens identified as D. macrocephalum may represent more than one species, examination of type- and voucher material revealed no relevant morphological differences between museum specimens and the present material. Information on infection levels of D. macrocephalum is provided from a large number of host specimens (n = 170). This species was more abundant in juvenile than in adult hosts and on the middle slope than on the upper slope; this may be related to ontogenetic and bathymetric diet shifts of G. melastomus. Sara Dallarés and Ana Pérez-del-Olmo contributed equally towards this study. We thank anonymous reviewers for their comments and suggestions. We are indebted to Dr Rodney A. Bray and Mrs. Eileen Harris (Natural History Museum, London, UK) for making the museum material available for examination. 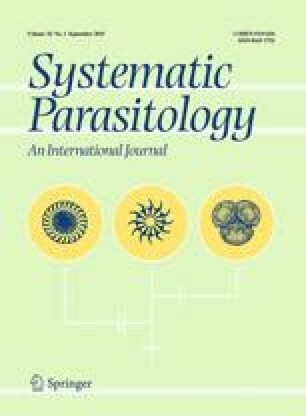 We also acknowledge Dr Aneta Kostadinova (Institute of Parasitology, Biology Centre of the Czech Academy of Sciences, Czech Republic) for her comments on the manuscript, Professor Janine Caira (University of Connecticut, USA) and Dr Veronica Ivanov (Universidad de Buenos Aires, Argentina) for their useful comments on morphological features of the specimens and Dr María Constenla and Mr. D. Pérez (both from Universitat Autònoma de Barcelona, Spain) for their help in obtaining fresh material. This study was funded by the Spanish Ministry of Science and Innovation (MICI NN) project ANTROMARE (CT M2009–12214–C02–02) and partially supported by the Czech Science Foundation (project ECIP P505/12/G112) and the Prometeo/2011/040 project of the Generalitat Valenciana. SD benefits from a PIF PhD student grant of the Universitat Autònoma de Barcelona.